Back to the fougasse.....it entails simple steps. 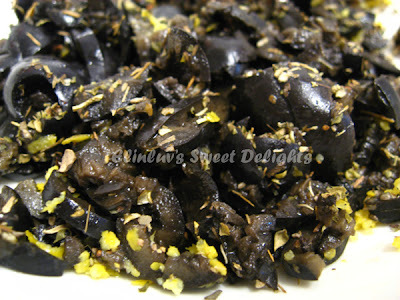 Combine coarsely chopped black olive , lemon zest, fresh rosemary ( I used dried mixed herbs ) together. Add them well onto the dough . You can use hand to manually mix the olive mixture to the dough . Leave to proof in a warm place for 2 hours. Knock down and keep in the fridge for at least 6 hours , so for me, it is best to prepare the dough the night before and get fresh piping hot fougasse for breakfast ! Love the crisp edges and the flavorful soft texture inside.....mmmm this is a keeper for sure. I made one with cheese topping and it turned out great ! I had it with a hot cup of nescafe in the office ! Dorie says this is best eaten warm or at room temperature. While it is good with cubes fo cheese and delicious dipped in olive oil, it is really best just on its own with a glass of wine. But for me, a cup of hot coffee or Nescafe would be great :) A good breakfast to start a tiring day :) I am excited each time I get to join my other Doristas in making FFWD recipe and today's recipe is this delectable French flatbread ....Provençal Olive Fougasse..
and delicious breakfast...WE both LOVE it ! I can't wait to read what the other Doristas have to say about today's recipe ! 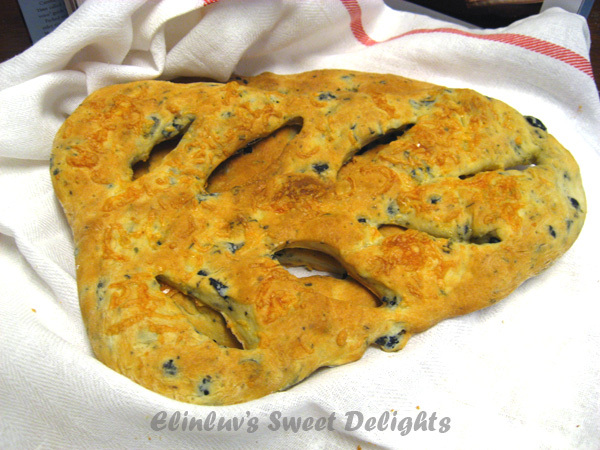 your fougasse sounds great with the dried herbs and cheese that you put in! Mr wild boar must be so excited smelling another great bread baking from the kitchen! I admire your determination in getting up at 5 to complete the mission! Your fougasse looks good and you've convinced me to have a piece for breakfast. I bet its good with a fried egg! Your crumb looks perfect! Mine didn't puff up much but I think it's my oven's fault. I did the same! Woke up to make this as my breakfast... and it was so good! 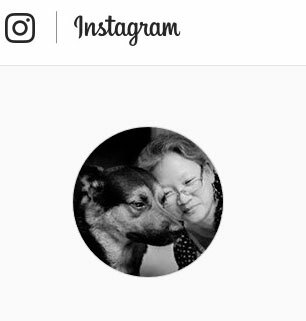 :) Yours looks beautiful. I should have kept the dough in the fridge longer...I only did 2 hours and it was tooooooo soft...and my kitchen is quite warm here in AZ so that probably helped to keep it soft. Next time I will overnight the dough in the fridge...yours looks perfect. I should have kept my dough in the fridge longer...yours looks perfect. I took mine out after only 2 hours and my AZ kitchen is warm and my dough was too soft...your fougasse looks perfect. Wow, fougasse for breakfast and with a cup of coffee...your pictures look great and the fougasse looks delicious! Wonderful post! Have a wonderful weekend! 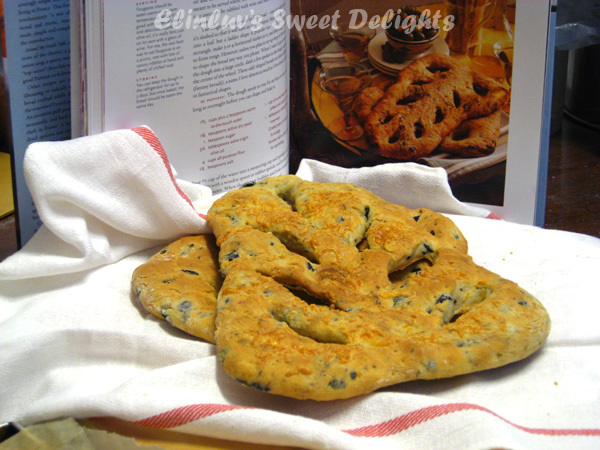 Lovely looking Fougasse…absolutely perfect! You are a dedicated person to get up at 5 am to bake…good for you! Have a great weekend! Oh my, 5am, I still gau gau chu leh. Not even 5.30am will be ok for me. Your fougasses looks beautiful! I'm saving my second "loaf" to bake for the inlaws tomorrow so I hope it's still good. Wish me luck! Wow Elin, you get extra points for waking so early to bake bread! Glad this worked so well for you. 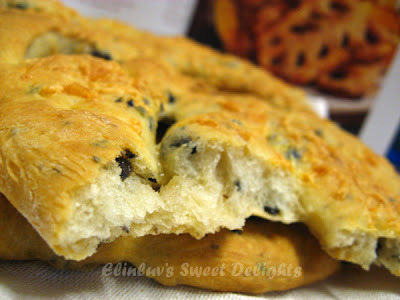 It is a great bread and your pictures show it! I am an early morning riser but feel your pain when you "have" to rise and shine. Oh, the pressure of a FFWD recipe and getting it made, photographed and posted on time. Good for you. And, your bread looked fabulous. You certainly made it with tender loving care and it showed. I didn't even think about breakfast. But, a good strong cup of coffee, fougasse, what a brilliant beginning to the day. getting up so early, you are one determined lady. work too. The end result is absolutely beautiful. Elin, I think it was worth it to wake up and have this warm for breakfast. 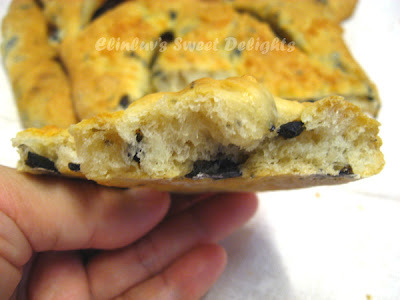 This recipe seems so adaptable that I was thinking that we should come up with another sweet version for breakfast too. What about mixing in dried fruit and cinnamon instead of olives and herbs (and keeping the citrus zest)? I don't know if I could get up that early for bread-making, but it sounds so worth it! I love how nicely shaped your loaf turned out to be. yours really looks like a leaf! Neat! This looks like bread heaven to me! 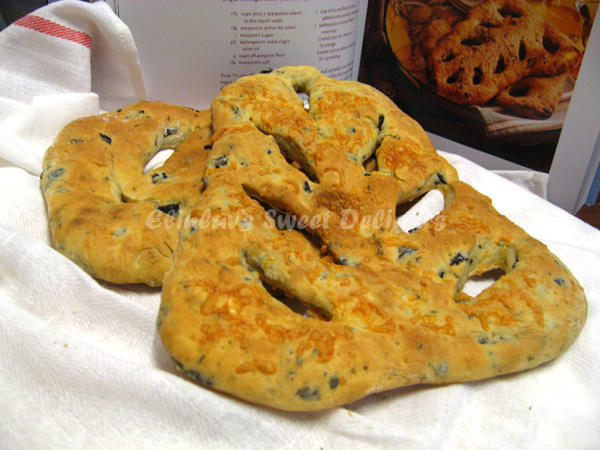 Your fougasse looks delicious! The cheese also sounds like a wonderful addition. Couldn't get to it this week, myself. Your bread looks so good! Just seeing it makes me want to bake some more! I like the idea of having it for breakfast...might have to do that this weekend!